"Words Are More Powerful Than Facts"
That is just one of the phrases that caught my attention during the SP Meet & Greet last November 29, 2011 at the Eastwood Richmonde Hotel. 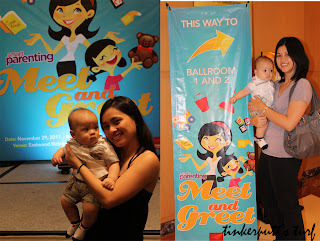 The SP or Smart Parenting Meet & Greet is an event of Smart Parenting Magazine for readers and bloggers to meet their editorial stuff. I, together with my sister and my son, were lucky enough to be one of the first registrants at the event and got invited to attend. The event started with a luncheon that was served, of course, by Eastwood Richmonde Hotel. Food by Eastwood Richmonde Hotel is , as always, delicious and mouth-watering. (sad I was not able to take photo of the buffet table). After enjoying the food, there was a talk on "How to Raise Successful and Happier Kids with the Power of your Words" which was conducted by Ms Aileen Santos, a Relationship Coach. As with the phrase I have used in my title and in the opening of this post, "Words are more powerful than facts". Any word that you use to your child or to anyone else for that matter greatly affects the person regardless of whether the words uttered were true or not. Words has such a great impact most especially to the kids, she stresses the value of words and labels that we, as parents, put on our kids. Labels such as "The Pretty One", "The Smart One", "Mana sa Nanay", "Makulit", and many more. These labels or words are stored in the kids subconscious mind, and they carry it until they grow up, they get accustommed to these labels and makes them who they are and not what they are born to be. No one is innocent of putting a label, I, for one, am guilty of such as I sometimes call Jabe as "Angel", "My angel", "kolokoy", "good boy", and other labels there is. But I guess it's not too late. I'll try my best not call Jabe or any other kid or person by label. After the talk, the SP Editorial Staff distributed themselves to all the readers. There were discussions about the magazine, the content, the cover, and other suggestions that we, readers, might want to see in the coming issues of the magazine. At first, I thought that 45 minutes is too long for that, but if as always, if the discussion is lively time flies so fast. It ended without us noticing that the time has already elapsed and everyone felt that the time was too short. Right after that, there was a raffle. And my name was picked and I won a Baby Care Bath and Lotion, yey for Jabe! Hopefully, we will still be able to attend the next SP Meet & Greet. Thank you Smart Parenting for the wonderful event! More power!